AKRON — Nathan Rourke stood outside Ohio’s locker room at InfoCision Stadium-Summa Field dejected. His face was stoic as he fielded questions from media. Rourke wanted to beat Akron for Ohio’s seniors. 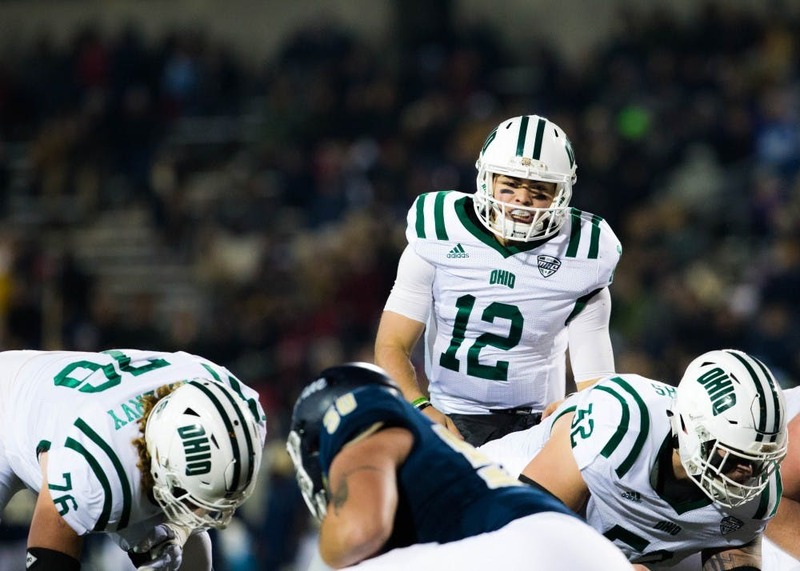 With a win, the Bobcats would have clinched the Mid-American Conference East Division and a spot in the MAC Championship Game for a second straight season. Instead, Ohio lost 37-34 against Akron on Tuesday night, losing control of its own destiny. Now, Ohio needs to beat Buffalo on Nov. 24 — and it needs Kent State to beat Akron next Tuesday. Kent State, at 2-9, is unlikely to upset Akron. And with that, the seniors will likely not have another chance at winning a MAC Championship. But Rourke, Ohio’s sophomore quarterback, has two more years left. Still, he wishes that the Bobcats were celebrating in the locker room instead of feeling disappointed. The Bobcats perhaps played the best defense they’ve gone against in the Zips. Whether it was playing tight man coverage or focusing on stopping the run, the Zips forced the Bobcats to pass. And at that, they forced the Bobcats to pass well. Rourke passed for 110 yards and threw two interceptions. He completed 40.9 percent of his passes. Rourke tied the Ohio record for most rushing touchdowns in a season Tuesday, tallying his 19th of the season. He’s been scrambling and cutting through defenses all season. But he knows that he needs to become a better passer. Rourke rushed for 165 yards and scored on a 68-yard touchdown run in the first quarter. A quality running football team, Ohio ran for 282 yards. The Bobcats couldn’t establish the run game as well as in the past, though. And with that, the passing game wasn’t there to complement the run. “When that (the run) wasn’t working, we didn’t throw the ball well enough to take advantage of them bringing their safeties so hard,” coach Frank Solich said. Ohio has struggled to throw the ball well in the past. When it went up against Bowling Green on Oct. 14, Rourke threw for 105 passing yards — that was a season low for the Bobcats. But Ohio also ran for 335 rushing yards that game, which canceled out the lack of the passing attack. Going up against Akron, though, Rourke was forced to make some tough throws. With the Bobcats down 37-34, they had a chance to score. On fourth down and three with under three minutes left, Rourke threw a deep pass to Papi White. White jumped up for it, and he dropped it. The Bobcats went out on defense for one last possession. But they were out of chances.